The daughter of Dr. Victor Frankenstein, Freda (Gina Romand ), is in need of the potent blood of Santo. With it, she can make a serum that will keep her young forever. She kidnaps the sister of one of Santo's friends in order to draw him into her trap. Of course, he is obliged to try and save the woman. He arrives in a seemingly abandoned town and soon has face not only Dr. Frankenstein's army of red t-shirt wearing thugs, but a hulking monster named Ursus. Daughter of Frankenstein contains more depth that your average Santo film. Freda Frankenstein's cadre of goons have inner lives. They get squeamish about gouging out eyes, they get frustrated trying to catch Santo, and they aren't above a little office gossip about the boss. Ursus, the full-on, Frankenstein monster plays up to tradition by being both a dangerous opponent and sympathetic. Even Dr. Frankenstein battles with the fact of her true age, and her spiky relationship with her lieutenant. For the normally slapdash characterizations of most Santo movies, this was all very refreshing. "...in between the couch cushions"
The look of the film bounces between colorful, and so ill lit that it is difficult to know what is happening. There are only a few fights and they are handled well enough. Santo's occasional bouts with Ursus are the most interesting. The film doesn't forget to be a horror movie and layer on some nasty aging makeup, acid burns, and a splash of blood. The normally dour Santo movies must have started taking some notes from Blue Demon's adventures, as it includes both some jazzy fight music and a little comic relief in the form of a woman who is a very vocal Santo fan. She never threatens to derail the movie, unlike some characters. Once the story settles into its horror elements, it largely remains there. It even manages to touch on the tragic lives of those caught up in Dr. Frankenstein's schemes. They aren't totally villains at heart, just driven to evil by their fears of aging to death. 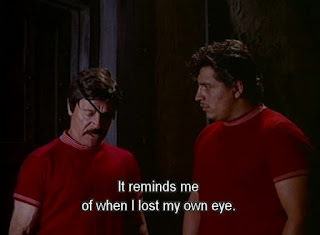 Another note that may have been borrowed from Blue Demon, is the fact that this is the first Santo film where he has an established super power. 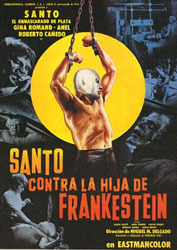 Dr. Frankenstein claims that Santo has a high 'TR' level, which is a mystery chemical that allows people to heal. She has discovered Santo has a higher TR level than most, and it's the reason he doesn't age and can take a lot of abuse. This is the whole plot set-up for her trying to acquire Santo's blood, and it's never really dealt with later. One curious moment is when a ring announcer mentions Santo's healing power, making seem like this a well known fact. Daughter of Frankenstein is great example of a what a Santo horror movie can be like. It has all the necessary elements, wrestling, monsters, blood, and beautiful women. It feels like more effort is being put into this production than most. 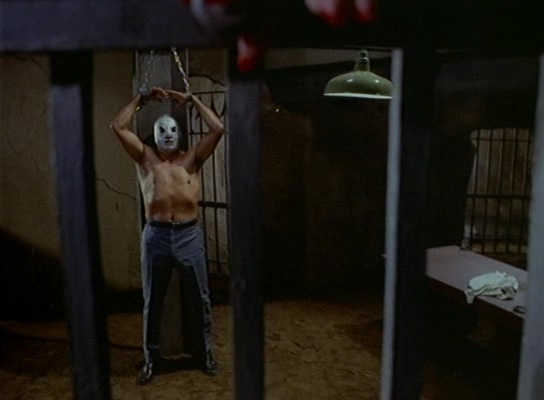 Santo actually has to struggle against his enemies, and the villains have more depth than expected. We know Dr. Frankenstein is the real deal when she not only manages to capture Santo, but unmask him (and kiss him of course). Daughter of Frankenstein starts strong and manages to keep thing interesting throughout.